A trayful of oaty goodness! Last night I watched the premier of Jamie Oliver’s new show, Jamie Oliver’s Food Revolution, on ABC. Now I have to tell you, most reality television does very little for me. I don’t watch Survivor or Big Brother, American Idol or the Real Housewives of anywhere. But this show is different, and it had a profound impact on me. If you haven’t watched it, I highly recommend that you click the link above and take a look. And I have to hand it to Jamie Oliver. He’s taken a big personal risk by going into the unhealthiest town in America, and trying to help them change their eating habits. I think the scene that struck me the most was when he went into a classroom, and the children couldn’t name a single vegetable…not a tomato or a potato…but they could easily name chicken nuggets, french fries, and pizza, because that’s what they were being served for breakfast and lunch at school, and probably for dinner at home, too. Now I actually make a pretty big deal of vegetables in my own home. As a mom of three young children, I take my kids shopping in the produce aisle, encourage them to try new ones they’ve chosen, and try to serve a vegetable at every meal. But then there are the nights when I work overtime, and we wind up eating pizza or fast food. My daughter’s favorite food when we eat out is chicken nuggets. This show made me take a good, long, hard look at places we as a family could improve. And I’m hoping it helps a lot of families do the same thing. We may be further along than some of the folks in the show, but there’s always room for improvement. So who’s with me? Will you join me in the quest to move away from processed food, and towards more healthy ingredients? Will you try and put a fruit or vegetable on the table for every single meal? I’ll be sharing recipes here as we go along (I will be sharing one today.) Would love to hear your thoughts on this. And here’s today’s recipe. 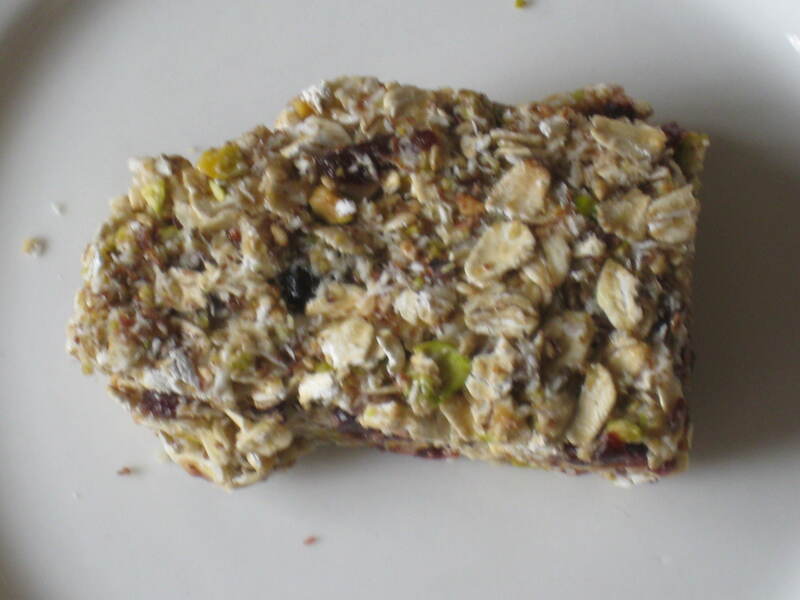 My kids love granola bars, but I don’t like how much sugar and fat are in them. I stumbled on this infinitely adaptable breakfast bar recipe by Nigella Lawson, and have adapted it. I’m also using it to teach my kids more cooking, another resolution I’ve made as a result of Jamie Oliver’s show. I’ve always had them do some cooking, but I’m more committed than ever to teach them how to prepare healthy foods they’ll enjoy. I hope you enjoy these recipes as much as I do! Preheat oven to 250 degrees. Spray a 9×13 baking dish with cooking spray. Heat condensed milk for 1 1/2 minutes in microwave-proof container, on high in the microwave. Pour warmed condensed milk over oat mixture, and stir with rubber spatula until combined. Pour mixture into prepared 9×13 dish, and bake in 250 degree oven for 1 hour. Allow to cool for 15 minutes, and then cut into 16 squares. We like to individually wrap the squares in plastic wrap, so we can take them with us. They get better the longer they sit. I hope you enjoy these as much as we do. My kids inhale them. And all the whole grains, seeds, and nuts make this a really nutritious and satisfying breakfast. Enjoy with a piece of fruit and a glass of milk! 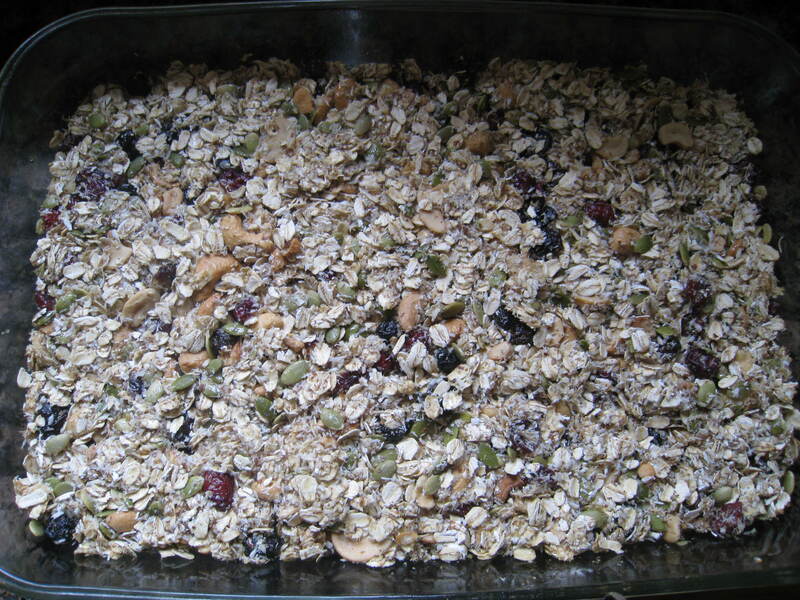 This entry was posted in breakfast, Uncategorized and tagged breakfast bar, cereal bar, flaxseed, oatmeal, recipe. Bookmark the permalink. I only caught about 5 minutes of this last night while kids were picking a movie but our family may be just a little behind yours until recently. My kids actually can’t stand any fast food places anymore. It’s funny, now if they’re misbehaving on a road trip we just say, be good or we’ll stop at McDonald’s for lunch! But I’ve gone a step further recently. I’ve found The Eat Clean Diet Recharged by Tosca Reno, so whenever possible, there is ZERO sugar in our diets – I sub in honey or agave nectar when possible. I don’t eat ANY preservatives anymore or processed sugar and I’ve cut out as much as I can from their diets too. They still have the occasional pizza and they take frozen meals to school for lunch. Those are at least slightly better than what the cafeteria here serves. Thankfully they have microwaves to use so sometimes they even take supper leftovers as does my husband. I’ve also learned to love the crock-pot for those days I know I’ll be running around until late with my ‘work’. Love the recipe share and the frank evaluation of where you all are, and what you plan to do about the state of nutrition in your home. Thanks again for a great post-and good luck with the “Fong Family Fruit & Veggie Challenge”! I’d be happy to guest blog for you. I’ll shoot you an email.